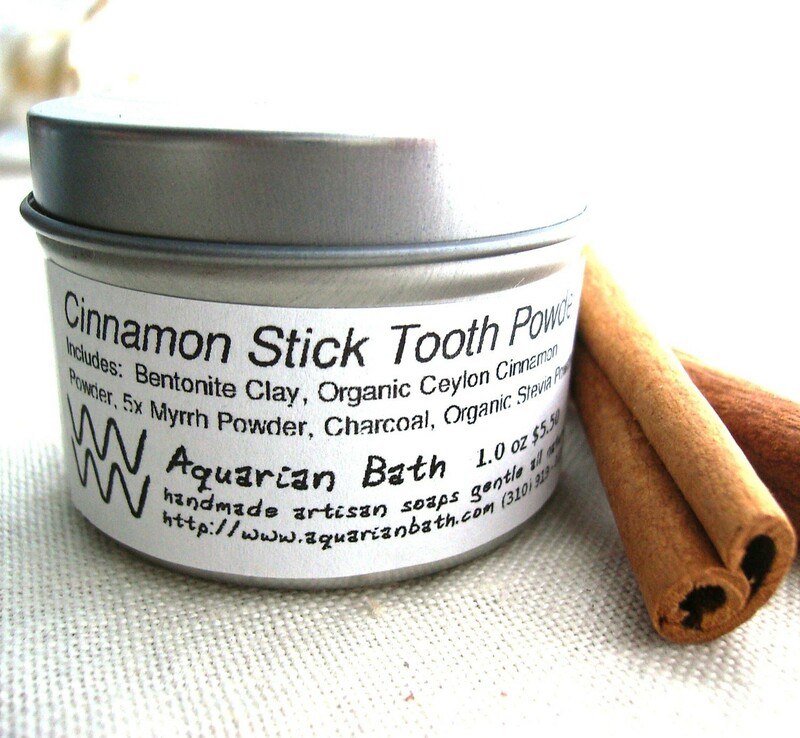 Aquarian Bath | Cinnamon Stick Tooth Powder for Cleaner, Whiter Teeth! You might think the idea of cleaning your teeth without using toothpaste sounds strange but in fact it’s quite amazing and so much healthier for you and your teeth! Many natural toothpastes can often throw in a few not-so-great ingredients in them and many contain Baking Soda which is fine in small quantities but when used too much or too often it can wear the enamel off of your teeth. All of the Tooth Powders from Aquarian Bath contain no baking soda. I have been using the Cinnamon Stick Tooth Powder by Aquarian Bath (you can also find them on Etsy) for over a few weeks in place of my usual Tom’s of Maine toothpaste. If you are looking for an all natural, completely clean, affordable and non-abrasive tooth powder then definitely check out this powder. Since using this powder in such a short time I have noticed that my teeth are whiter and less sensitive and I also feel like this powder cleans better than any toothpaste I have ever tried (chemical-filled or not). It doesn’t irritate my gums like many toothpastes tend to do and I never experience tooth sensitivity anymore which I used to quite a bit, especially when drinking cold or hot drinks. I am proud to say that I am now a tooth powder convert! This tooth powder is pretty much the most natural way you could clean your teeth but when used regularly you will see how these few (and incredibly potent) ingredients will help to not only whiten your teeth but heal gums and fight any bacteria or bath breath. It also leaves your teeth looking and feeling smoother and healthier within just a few uses. Ingredients: Bentotine Clay, Organic Cinnamon Powder, Activated Charcoal, 5x Myrrh Powder, and Organic Stevia. Bentonite Clay and Activated Charcoal help to detoxify and wash away bacteria from the mouth. Activated Charcoal helps to whiten teeth. Myrrh extract powder helps to tone the gums. Cinnamon has been used for dental care prior to the invention and regular use of toothpaste and can help prevent cavities. Note: Because of the natural darkness of the Activated Charcoal, you will need to take extra care when rinsing your mouth. Make sure to rinse until there is no residue left over. The powder is very easy to rinse off. Make sure to clean out your sink immediately after brushing as the Charcoal can tend to leave a dark residue left over! **Do not add water to the jar of dry powder. Only add water to the palm of your hand or directly to your brush and massage gently into your palm to pick up the powder on the bristles. Price, Size and Where To Purchase: This tooth powder comes in a 1 oz ($4.95) or 2 oz ($6.95) container. You can purchase this powder or any other tooth powder directly on Aquarian Bath’s Website or on their Etsy Shop. Other Flavors: If you aren’t a fan of Cinnamon, no worries! This tooth powder comes in Mint, Black Licorice, & Berry Hibiscus. Have you ever tried this or any other Tooth Powders? If so what were your experiences? I’d love to hear your thoughts and if you would ever be interested in trying out something like this! Way cool! I’ve been looking for a toothpaste without the gross chemical Sodium Lauryl Sulfate and this seems awesome! Thanks for your comment Sarah!! This is very important. Would you be able to use the other flavors? They have mint, licorice and berry. Maybe those would suit you and others will Perioral Dermatitis? DANTA MANJANAM as a preventative and cure for mouth infection and to add strength to the teeth and gums. Effective on all oraldiseases such as tooth wormsand stops tooth decay. It also reduces the sensitivity in teeth,the swelling of gums, cures ulcers of the tongue, sore throats, tonsillitis and pyorrhea. It also refreshes the the mouth and is a breath freshener. Directions: Use a small amount of tooth powder on a tooth brush to clean the teeth twice a day after every meal. It can also be used to gargle. Ingredients: Ash of cow dung, 5 salts, camphor, carum ajowan, mint, clove, triphala, neem, ficus benghalensis L (root) eucalyptus and utaraini (onga). This tooth powder looks fantastic! Glad you ditched the Toms stuff, then ingredients list in that freaks me out. I might order this one! Thanks! I plan to get my hands on some and try it for myself – your teeth look lovely though, not in need of whitening at all. wow..this seems a great thing. I ve been trying baking soda trick for quite a while but not working. My teeth hv never been ‘white’ i hope this is available in US. It is available in the US! The baking soda on it’s own never worked for me either and if anything seemed to aggravate my teeth. baking soda can be quite harsh. You are better off to only use it once and awhile if even at all on your teeth! Many people over use it to try and whiten their teeth but instead are wearing away at their enamel! This looks amazing! It’s weird, but although I’ve taken great care to make sure that my skin care and hair care products are completely natural, I hadn’t given much thought to my teeth. Definitely going to try this! I definitely will! I just ordered some for my sister and me. Hopefully this will help with the annoying tooth sensitivity I’ve been having. My dentist just told me to use Sensodyne toothpaste, but it’s not helping much! Do you brush your tongue with this as well? I’ve tried brushing with castile soap before, but that tastes terrible when brushing my tongue. Thanks for this product! 😀 You are fantastic at researching all of this!